It’s fair to say that Yala National Park offers probably the best game viewing in Sri Lanka. The total park size is 980km sq, though this is split in 5 ‘blocks’, each with increasingly strict limits of access. In the south east of the island and bounded by sea and river, Yala is made up of scrub jungle, huge rocly outcrops and plenty of fresh water ponds, lakes and brakish lagoons.The eastern limit of the park is formed by the Indian Ocean, made up of high dunes and broad sandy beaches. 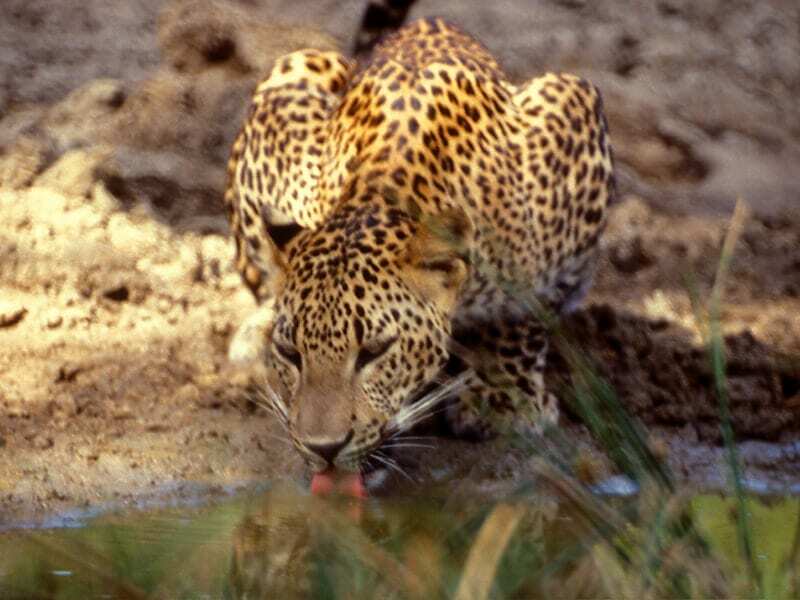 The park is famed for both it’s elephant, and growing population of leopard. Alongside these signature animals there is plenty else to see in wet or dry seasons. The 130 species in the park include easy to spot peacocks, water buffalo, white spotted deer and bird life, whilst with a little patience wild boar, monitor lizards, shambur and sloth bear can be seen. Yala also contains a large number of historic ruins, from the Ruhunu culture, and is an important pilgrimage site for Buddhists. Entrance fees for the park are $30 for a day’s entry. The best place in Sri Lanka to try and spot the elusive leopard, though you can also take some time out on a very nice Indian ocean beach, weather permitting. Game drives are the only thing on the agenda at Yala. There’s no public transport to Yala, but whoever you arrange a game drive with will pick you up from your hotel as part of the price. If you’re doing a self drive, you’ll need a 4WD to access most areas of the park. Since the 2004 tsunami there is no accommodation at Yala National Park, and no camping permitted. Several operators offer an overnight camping expedition in the area surrounding the park, which is still rich in wildlife.